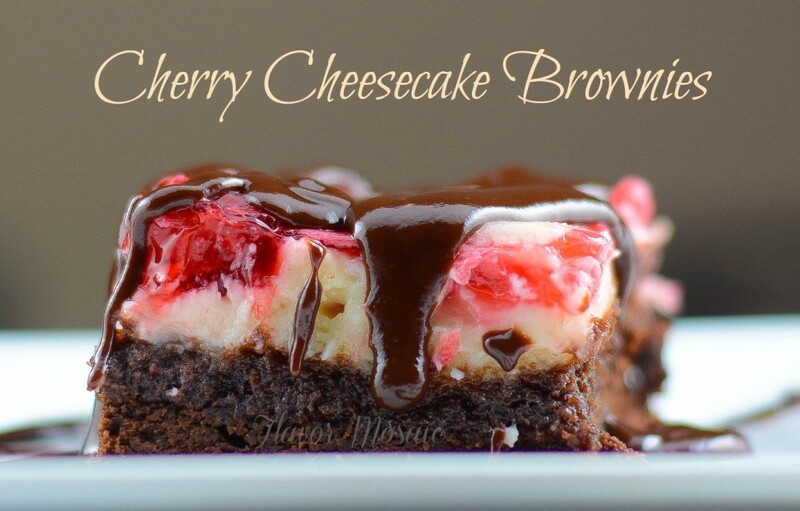 These Cherry Cheesecake Brownies look beautiful and taste even better. No box brownies here. I use my Best Brownies recipe for the brownie layer and then a simple cheesecake recipe for the cheesecake layer. Then it is topped with cherry pie filling that is swirled in with the cheesecake layer. OMG! But wait. There’s more! 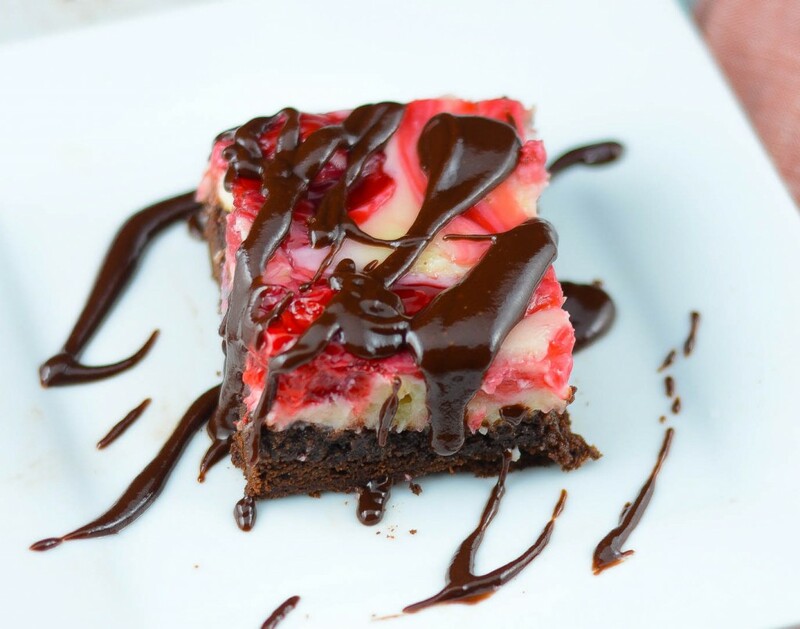 A chocolate ganache is drizzled over the cheesecake brownie to take this dessert over the top. It tastes amazing! 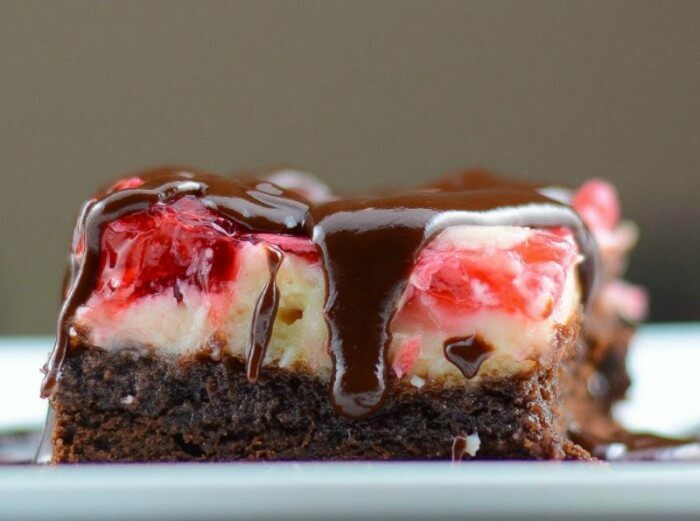 The hardest part about making these cherry cheesecake brownies is waiting for them to chill after you bake them. I had to hide them from Mr. Flavor Mosaic so he would not eat them before I took the photos. It took great restraint on my part as well to resist them until the photos were taken. 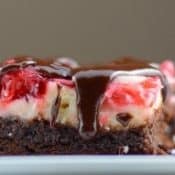 These cherry cheesecake brownies are perfect if you want to impress that special someone, or have a date night planned, or for Valentine’s Day. They are so fabulous I wouldn’t be surprised if you received a marriage proposal if you made them. No promises, but it’s possible. Preheat oven to 350 degrees F. Either spray with baking spray or grease and flour an 8 inch square pan. For the cheesecake layer, in a large bowl, mix together the cream cheese, sugar, egg, and vanilla. Set aside. For the brownie layer, in a large mixing bowl, cream together butter and sugar. Mix in the eggs, and 1 teaspoon vanilla. Stir in cocoa, flour, salt, and baking powder. Stir until everything is evenly combined. Spread the brownie batter evenly into the prepared baking dish. Spread the cheesecake mixture evenly over the brownie mixture. Drop the cherry pie filling by spoonfuls on top of the cheesecake layer. Then take a knife and swirl the cherry pie filling through the cheesecake layer. Bake in a preheated oven for about 45 minutes. The cheesecake layer will still jiggle in the middle even when it has finished cooking. Then chill in the refrigerator for at least 4 hours. While the brownies are chilling, make the chocolate drizzle by adding the chocolate chips and 2 teaspoons of butter in a small bowl and microwave for about 30 seconds. Stir until smooth. Microwave again for another 30 seconds if it is not melted after the first 30 seconds. Stir and then spoon over the top of the cheesecake bars before serving. This recipe was inspired by Cherry Bliss Brownies on AllRecipes.com. 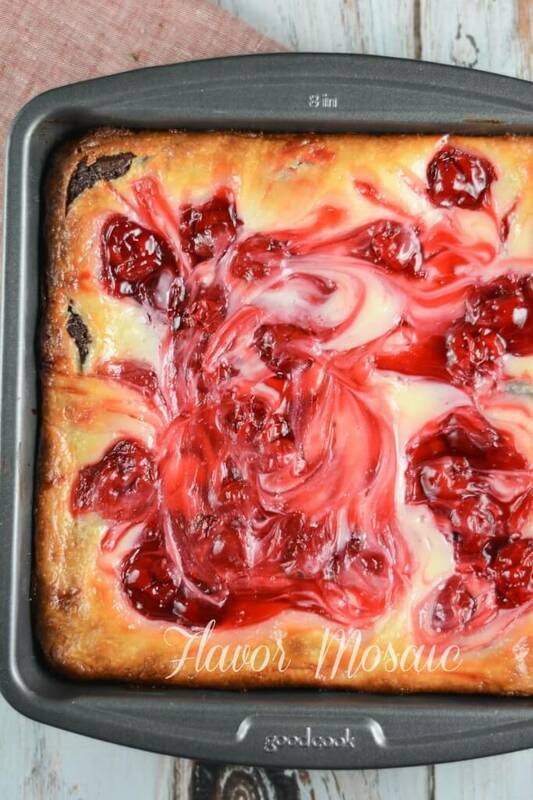 If you like these Cherry Cheesecake Brownies, you might like my Best Brownies recipe. 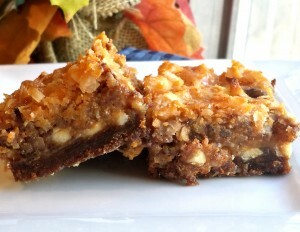 Another recipe you may like is the Pumpkin Magic Bars. 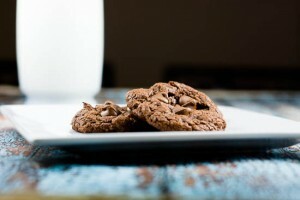 If you want more chocolate, try these Easy Nutella Chocolate Chip Cookies. 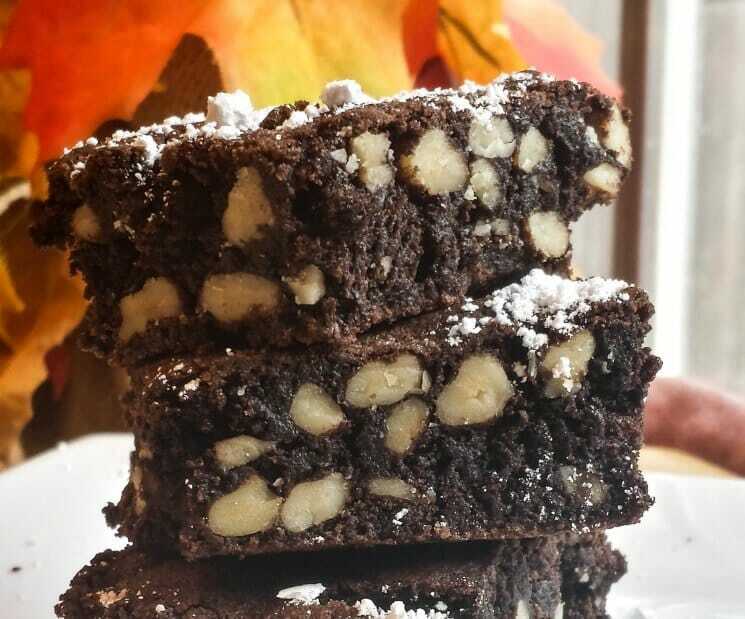 For more over the top, fudgy, chocolatey brownies, try these Oreo Overload Brownies by Anyonita Nibbles. Oh yum these look so delicious! Thank you for sharing at The Wednesday Round Up and we hope to see you back next week! You’re welcome. I look forward to it next week. You had me at Cherry Cheesecake! 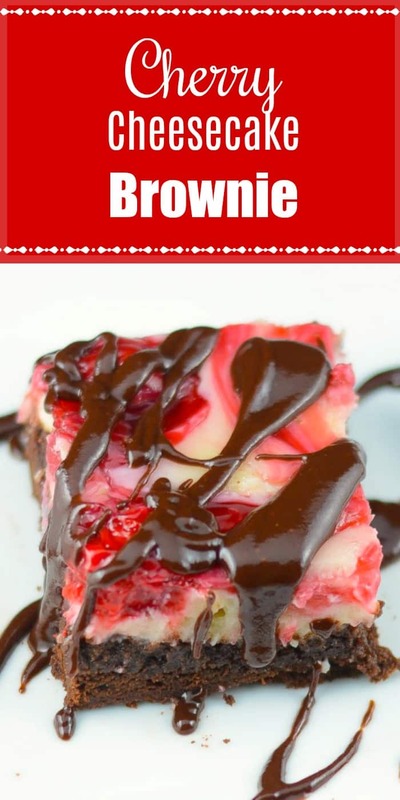 Then, you added brownie and I literally started drooling! I can’t wait to try this – my son and I would devour them! Thank you so much for featuring my recipe! I will stop by tomorrow. are these good for mailing? I really want to send them as a gift but don’t know if they will maintain flavor and freshness.